Well, the most important person of note is Dirk Obbink who is [inaudible]. Dirk Obbink is an outstanding scholar. He’s one of the world’s leading specialists on papyri. He directs the collection—for students who are in here, you may remember hearing the word “Oxyrhynchus Papyri.” He is the director of the Oxyrhynchus Papyri. I can’t speak to his personal faith positions and I don’t think he would define himself as an Evangelical in any sense of the word, but he is not—he doesn’t have a derogatory attitude at all. He’s a supportive person. He specializes in the dating of handwriting. And as he was looking at the—both times I saw the papyrus, it was in his possession. So, it was in Oxford at Christ Church, and actually on his pool table in his office along with a number of mummy heads. 3. Just how many early fragments of Mark are there, anyway? One of the problems of the “Early Text of Mark” is that there are so few early manuscripts. We have only one Greek manuscript of Mark earlier than the 4th century, P45. FCM is supposedly a fragment of Mark 1, and P.Oxy. LXXXIII 5345 is definitely a fragment of Mark 1. Assuming that the report that FCM is from Mark 1 was correct, what are the odds that we are seeing two early fragments of Mark 1? Unless Josh McDowell was wrong about the text on FCM, it is a very reasonable conclusion that P.Oxy. LXXXIII 5345 is FCM. However, if P.Oxy. LXXXIII 5345 is indeed FCM, we also have a few problems. 1. Was an unpublished Oxyrhynchus papyrus really up for sale? Carroll told Josh McDowell that the Greens were possibly in line to purchase it, that they did not purchase it, but that the papyrus had since been sold. Who could have offered it for sale? Carroll: I know, wouldn’t that have been awesome? But it was just not the timing and so it was passed on, delayed. It has since been acquired. I can’t say by whom. 2. Could a papyrus that was not obtained through Grenfell and Hunt’s expeditions be published as an Oxyrhynchus papyrus? If FCM were for sale, I suppose it is possible that it originated in some other collection. If that is the case, however, why is it being published with the Oxyrhynchus Papyri? FCM is finally being published as P.Oxy. LXXXIII 5345. We still do not know the date (UPDATE: see below). It might not be first-century. Maybe a reader has access to the latest volume and can confirm the editors’ date. The fragment is very small. It has only parts of six verses from Mark 1. The fragment tells us nothing about the famous textual variants in Mark 1:1, Mark 1:41 or the Ending of Mark. A papyrus document that is now published as part of the Oxyrhynchus Papyri was, at some point, offered for sale. Who was the seller? This situation is still very unclear. Statements made over the years have been inconsistent and even contradictory. For example, the Live Science article featuring Craig Evans claims that FCM came from a mummy mask, but Scott Carroll—who seems to know more about FCM and extracting papyri from mummy masks than anybody else who has spoken publicly—said that he saw no evidence that it came from a mummy mask. If it is the case that P.Oxy. LXXXIII 5345 really is FCM, then perhaps the publication will include some explanation of the fragment’s history that will clear up most (or ideally, all) of these questions. UPDATE 1 (23 May 2018): Peter Gurry has accessed the edition and confirmed that this fragment has been dated to the “(later) second or (earlier) third century.” Either there are two early Mark fragments (highly unlikely), or the “First-Century Mark” is not first-century, after all. UPDATE 2 (23 May 2018): Scott Carroll himself weighs in (see comments below), and Dan Wallace finally speaks out. Wallace confirms: P.Oxy. 5345 is FCM. UPDATE 3 (24 May 2018): I have removed the images of the edition and papyrus, per the request of one of the editors. UPDATE 4 (24 May 2018): I (Elijah) have updated the post to remove images, hoping that it will stay this way without other bloggers adding in images, as interesting, helpful or amusing they may be. As of 25 May 2018, this significant discrepancy remains unresolved. Brent Nongbri has a helpful post on the inventory numbers of Oxyrhynchus Papyri, here, among other good posts. Malcolm Choat (among others, I’m sure) brings up the issue of the non-disclosure agreement and its relevance for this unfolding situation. UPDATE 6 (25 May 2018): The Egypt Exploration Society has made the edition of P.Oxy. 83.5345 available via a link at the end of their statement, here. And there was much rejoicing. They report that a fuller response is forthcoming (see comments below). 1. Their timeline seems a little off. They present the story as if the whole issue started when the EES made their statement yesterday (24 May). Though they are critical of evangelicals and the Greens, they neglect to mention that the news of the publication broke right here, a day earlier, by an evangelical with ties to the Greens. I apologise if I was unclear, but “in other words” reads a level of malicious or deceptive intent into my question that I never meant to convey. It’s a great question to ask—it just wasn’t my question. I am unaware of any efforts they might have made to clarify what I meant before publishing the article. I asked that question before the EES statement. I was not implying that P.Oxy. 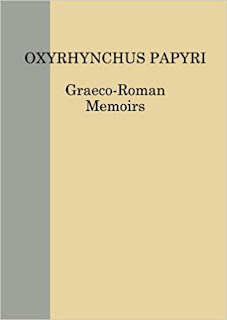 83.5345 was laundered by publication in a respected series but merely asking if it were possible for a “non-Oxyrhynchus” papyrus to be published in the Oxyrhynchus Papyri series. The answer is yes—it is possible. Brent Nongbri mentions that, in the past, some of the published papyri were bought, not excavated. Nonetheless, Moss and Baden do raise an important question about the possibility of laundering papyri. It is unclear if there are any records that could confirm Carroll’s story. He doesn’t seem to say whether the emails would vindicate him or not, only that he no longer has them. Still, this is the first time I’ve seen any statement at all from Obbink, and that is certainly worth noting. 3. Moss and Baden write, “And, for the first time in over a thousand years, something about this ancient pile of garbage stinks.“ Except for that other time it stank. Still, a very nice rhetorical effect. Unrelated to Moss and Baden’s article: People who use the Twitter inform me that the hashtag is #poxy5345. UPDATE 8 (26 May 2018, PM): I have removed “+?” from the update numbers because a fellow blogger doesn’t like them (though I only added them because he was adding things between my own updates!). Transparency announcement, I know. One matter to consider, however, is that Scott Carroll never claimed that EES offered the papyrus for sale (someone please correct me if I’m wrong here). He said that Dirk Obbink offered it for sale. Some have suggested that Dirk Obbink did offer it for sale but was acting on behalf of the EES. I think we can categorically deny that possibility. Whatever happened, that was not it. Certainly, the EES has never offered this fragment for sale, through Obbink or otherwise. In all seriousness though, Peterson does pick up one one important detail from the Moss/Baden article, that they also mention in their book, Bible Nation: The United States of Hobby Lobby: Steve Green knew about “FCM,” and he considered it to be a possible acquisition. Moss and Baden approached Mike Holmes and David Trobisch about “FCM” and they both gave vague answers about it. Moss and Baden write, “When we asked Steve Green himself, however, we got a very different response. Green was clearly familiar with the Mark fragment: ‘At some point it was like, this is an item I want to pursue’” (Bible Nation, p. 41). Holmes turned out to know a little more about the fragment—”he believed it to be located in the UK” (p. 41). Here’s what I find interesting: Moss and Baden’s interactions with Trobisch, Holmes and Green actually seem to corroborate parts of Carroll’s story. Holmes thought “FCM” was in the UK, but of the three, only Steve Green seemed to be well aware of it. He even thought of it as a possible acquisition, as I mentioned. If Carroll were telling the truth that Obbink offered it for sale in 2011 and again in 2013, and if 2013 was the last time it was offered for sale, that would explain why Carroll and Green know so much about it, but Trobisch and Holmes are less familiar. Trobisch didn’t come into the picture until 2014, and Holmes was not in his present position until 2015. If Carroll is telling the truth, this all happened before Trobisch and Holmes had anything to do with acquisitions. Another question to consider is the Brill association. Dan Wallace thought that “All the details will be coming out in a multi-author book published by E. J. Brill.” Craig Evans told Roberta Mazza in 2014 that Brill would publish the fragment. Evans seems to be mistaken about the fragment coming from a mummy mask, but both Wallace and Craig Evans cite Non-Disclosure Agreements about why they can’t say more. I am reluctant to believe that all the evangelicals are lying, and the other option seems to be misunderstanding on a massive level, which also seems unlikely. We know that Brill has a series dedicated to the Museum of the Bible, Carroll worked for the Greens when he claims Obbink offered him the fragment, Steve Green thought of the manuscript as a possible acquisition, At least two people affiliated with the Greens (Holmes and Carroll) knew that this possible acquisition was in the UK. It seems as though nearly everyone just assumed that the Greens owned it. Roberta Mazza was one of the few people who was wise enough not to make that assumption. Maybe I am more interested in the why than the what. After all, the fragment never sold. It has been published. It didn’t come from a mummy mask, and there is no more speculation about its text and date. In a sense, it’s water under the bridge. I’m actually not here to defend the evangelicals simply because I am one myself—I am not opposed to criticising bad evangelical scholarship on textual criticism when it does need criticising. I would like to think that I am “on Mazza’s side” in that respect, but I cannot shake the question, why do we have two different narratives about it? Unrelatedly, you should read Brent Nongbri’s blog. He’s been writing some great posts about the Oxyrhynchus papyri lately. Also, Kurt Jaros interviews Dan Wallace on P.Oxy. 83.5345. I haven’t watched it all yet. Thanks for this post. Could there be two early fragments of Mark, one part of the Oxyrhynchus collection, and the other on the market, with reports about one being conflated with the other? Also, if it is the FCM, the volume's blurb severely undersells it: "only the second Egyptian witness to the Epistle of Philemon as well as further early witnesses to the text of Mark and Luke" Anything of Mark before the 3d cen. P45 would be the "earliest" not merely a "further early witness." Amazon UK is now showing multiple copies - curiously some used. "But the collection has juxtaposed very large fragments with very small fragments because even a small fragment can confirm or disconfirm a disputed reading in one of the Synoptic Gospels, for example, and provide the earliest manuscript witness to it." Could be yet another reference to the Mark fragment, which presumably was in its final editorial stages in preparation for its publication the following year. FYI to Elijah's point 2, the EES website says that this volume mostly covers Grenfell and Hunt "but also cover[s] other papyri and Graeco-Roman material held by the Society." So in theory it's possible. That omission is the omission of O IHSOUS from Mark 1.17, which is interesting because it agrees with Matthew at this point (not mentioned in NA28 but is in Huck/Greeven Synopsis; this manuscript [which I'm deducing is P137] with some much later support). Yes, a reading we know of in several other MSS. Possibly a simple case of parablepsis, as the editors note, with αυτοιϲοι̅ϲ̅. I think once you figure out the average line lengths it is clear that this manuscript must certainly have had the shorter reading in Mark 1.1 (= P137 vid). A world class palaeographer told this to a friend of mine. Will Tommy now have to withdraw his "The Son of God" article from circulation? I am very confident that this is the papyri that was described as First-Century Mark. I look forward to Dan Wallace's confirmation that this is the case. Papyri = plural. Papyrus = singular. Yes; papyrus. I am writing rapidly. D. Obbink offered a papyrus of Mark 1 for sale in late 2011 to the Greens and it was still in his possession and he was trying to sell it in 2013. On both occasions, he unequivocally said that the papyrus dated to the late first or early second century and detailed reasons for his dating. He gave no clear indication about its provenance. Without seeing the pictures, I can not confirm if P.Oxy LXXXIII 5345 is the same papyrus he was trying to sell but it seems certain. Doc, your blogger profile says you are Scott Carroll. Is that true? If you saw photos, could you confirm? The Update image has "Plate ooo"? Is this from a draft? I would hope so. `I believe it is the same passage. As for it being offered for sale and being published as a Oxy papyrus, it's possible that the papyrus had been deaccessioned. Some might read this and conclude that when other scholars appealed to the authority of Obbink for the early dating of this manuscript, it was Obbink the salesman, not Obbink the papyrologist, whose claims they were repeating. As for it being the second fragment of Mark from Oxyrhynchus, the first was 069 (10.50-51; 11.11-12). On an (un)related note, I'm not sure about your current contact information, but I was hoping to talk to you about a papyrus from the Green collection I am currently working on publishing. If you are willing and able, you can find my email on my profile. You write: "D. Obbink offered a papyrus of Mark 1 for sale in late 2011 to the Greens and it was still in his possession and he was trying to sell it in 2013." I'm not sure I see any contradiction here: It was Obbink, not the EES, that offered the fragment for sale. The implications of this are, sadly, obvious. Do you know who owns the fragment? It sounds like the EES are very confident, so perhaps they are the owners? If so, would that mean Obbink was trying to sell a fragment that was in his possession, but that he did not own? Wouldn't that be illegal? Read the comments by the EES in this thread below. The fragment has been part of the collection since the time Grenfell and Hunt excavated it in 1903. No where in the EES comments below do they identify who owns the collection. Do you know who owns the collection? The EES owns the collection. Thanks for the straight answer Elijah - much more helpful than Peter's comment. So it appears D. Obbink was trying to sell a fragment that belonged to the EES. As Scott mentioned above, could it have been deaccessioned, or perhaps Obbink was under the impression it was deaccessioned? The EES seems to have ruled that out by asserting it was never put up for sale, so why was Obbink trying to sell it? Hi Scott, someone with access has posted an image of the fragment online, see the below link. Hope this helps. Scott, you state that Obbink "detailed reasons for his dating" the papyrus to the late first or early second century. Can you share the reasons you were told this fragment was so early? Reading the publication of P.Oxy. LXXXIII 5345, there is nothing in there to hint at such an early date. A first-century date would be so extraordinary, it should require extraordinary evidence. What reasons were you told for such a date? Some mught wonder if Dr. Carol got it backwards. Perhaps Dr Caroll, in conversations with Obink heard what he wanted to hear concerning his being able to acquire it for the Greens. Scott, thank you so much for weighing in. The way this papyrus was promoted and the promise of its soon appearance followed by years of delay was really quite shameful. Yet true to Wallace's bragging that it would be like the dead sea scrolls. Just not in the way he meant. To defend Wallace the claims were coming from seemingly reliable sources. It even gave me pause in my own skepticism when I first got wind of it. The inventory number, 104/14(b), is interesting. I think numbers in this format (lacking a capital "B" number) are usually associated with the boxes that Hunt (and then Lobel after him) kept in Queens College. It would be good to know if there is a hand-written "black ink" number on the papyrus itself. "Somewhere along the line, I learned that the world-class papyrologist who dated the fragment to the first century had already, prior to my debate with Ehrman, adjusted his views. He was not so certain about the date (perhaps it was early second century). I learned that the rep knew, two weeks prior to the debate, that the papyrologist had changed his views." "D. Obbink offered a papyrus of Mark 1 for sale in late 2011 to the Greens and it was still in his possession and he was trying to sell it in 2013. On both occasions, he unequivocally said that the papyrus dated to the late first or early second century and detailed reasons for his dating." What statements have been made by D. Obbink at what times regarding the dating of the fragment? Is there a problem if it was sold unpublished? That is, afterall, how many of the DSS were acquired. Also I recall a video where a gentleman with direct access to FCM bragged about taking it from the inside of a mummy's mask by soaking it in a kitchen sink. The expert above seems certain this Mark bears no evidence of this process. I wouldn't be too quick to dismiss another true FCM. Please, can we at least learn something from this, to never again claim that a scholarly book is going to be published "within the year?" I can't count how many years I had to hear this regarding FCM; even a book "published in 2017" is unlikely to even be touched by a reader before half of 2018 is already past. This is what happens when religious zeal and apologetics is placed over sound academic process. The protracted delay in publication and disclosure was very troubling, as lamented by numerous scholars. Also, the shroud of secrecy and insulating the entire matter from the scholarly community (not to mention the non-disclosure agreements) is wholly unacademic and reeks of agenda. Perhaps I am not being as charitable as I should. Dr. Dan Wallace didn't have to agree to make the grandiose statements just because a representative of the document wanted to make a sensational splash in such a big debate - especially without fact-checking. He should have just said to the representative, 'why don't you have that manuscript published and examined by the critical scholars first and that is the best way to get a new discovery out in the open'. That would have been the appropriate way a scholar would respond to such request. Yet, Dr. Wallace lit a fuse to an explosive six years ago and walked away from it (under the shroud of a NDA). Dr. Craig Evans has also co-signed this project. So I'm interested in hearing from him as well. Fortunately, Dr. Wallace has apologized for his role in this. I appreciate his apology. But this has impacted my view of his academic credibility. Have you seen this 2012 interview? HH: I’ve got to tell you, Professor, you turned a lot of heads when you alluded in your recent debate with Bart Ehrman to a new manuscript, or fragment of a manuscript concerning the Gospel of Mark. I know you’ve got scholarly restrictions on what you can and cannot say, but can you tell the audience what you’re allowed to disclose about that? DW: I’ll be happy to. First of all, there is a fragment of Mark, and it’s a very small fragment, not too many verses, but it’s definitely from Mark. And the most amazing thing about this is that it’s from the 1st Century. We don’t have any other New Testament manuscripts that are written within the same century that the Gospels and the rest of the New Testament were written in. This is the first. And it’s dated by one of the world’s leading paleographers, whose name I’m not allowed to reveal yet. It will be published in a book with six other manuscripts that are either probably or definitely from the 2nd Century in about a year from now. And this is very, very exciting news, frankly. To have a fragment from one of the Gospels that’s written during the lifetime of some of the eyewitnesses to the resurrection is just astounding. Thanks for all the reporting on this over the years! It has been an intriguing story to follow, even if it has a somewhat anticlimactic ending. I'm interested to know if this indeed was from a deaccessioned stash of papayrii fragments in the basement of some museum. And if it is, how many more biblical papyrii are languishing in basement boxes still to this day? Well, Mark 1:17 without ο Ιησους instead of αυτοις ο Ιησους. I can just hear the KJV Only crowd now (dripping with a heavy dose of sarcasm). I do like the idea that it is a nomen sacrum. The thing that bothers me most over the entire issue of FCM and 5345 is the entire secrecy of the process and the duplicity of the owner(s) and the representative who used Dr. Wallace. Just prior to the debate, this representative discussed with me the discovery of FCM. It was my understanding that their group had purchased the papyrus; had I known otherwise, I never would have made the public announcement. I was urged—and authorized—to make the announcement at the debate. I was also told that a high-ranking papyrologist had confirmed that FCM was definitely a first-century manuscript. On that basis, I made the announcement." Now, it is great that the papri 5345 has been published. Again (sounds like a broken-record), we now have to apologize to the academy as well as the community at-large about the mistake, error, etc. Do I blame Wallace? NO! I do blame the papyrologist and his/her representative for LYING! After initially claiming that 5345 was FCM, telling people that it was, encouraging pronouncements to that effect, and then, when changing their minds to 2nd-3rd Century CE, not announcing the change and using a "non-disclosure agreement" (NDA) to prevent any discussion, corrections, etc. to be announced is "abominable." The academy should censure both paprologist and his representative, publicly AND DEMAND, a public apology on this blog and to Dr. Wallace. Dr. Wallace as already acknowledge his role (unfortunately to have happened). Finally, any work by the papyrologist MUST be peer-reviewed BEFORE any work is submitted for publication to the academy and the public for a length of time to be determined by the academy. The duplicity is equivalent to plagarism. It needs to stop. I feel all this Mark stuff is overshadowing the much more exciting fact that volume LXXXIII contains a drawing of a unicorn. Yes, thanks for that. I tend to agree and can't wait to see the picture. I think Schmidtke is working on unicorns in antiquity at the moment. If I could figure out how to post a photo here I would. I have posted a picture of the unicorn as an up-date to the main post. Well done. The unicorn certainly boasts better looks than the shabby Marcan fragment! Sadly Elijah has cleansed the blog of this late textual corruption. It seems that he is still taking it all seriously. ἂφες τὸν παλαιόν, μὴ μεταποίει! Hmmm...you left out ἀμαθέστατε καὶ κακέ ...Possibly an orthodox corruption? Definitely an orthodox corruption. A theologically-motivated harmonization in content to Matt. 5:22, made by omission. Omissions are not always accidental, after all. I am waiting for the day when we uncover a papyrus with a drawing of the Goat Stag. 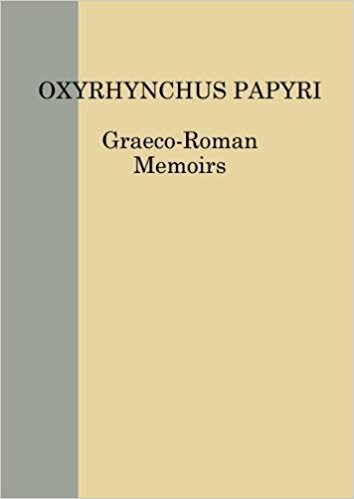 In the latest volume of the Oxyrhynchus Papyri, volume LXXXIII text 5345, Professor Obbink and Dr Colomo publish a fragment from a papyrus codex (book). The two sides of the papyrus each preserve brief traces of a passage, both of which come from the gospel of Mark. After rigorous comparison with other objectively dated texts, the hand of this papyrus is now assigned to the late second to early third century AD. This is the same text that Professor Obbink showed to some visitors to Oxford in 2011/12, which some of them reported in talks and on social media as possibly dating to the late first century AD on the basis of a provisional dating when the text was catalogued many years ago. Papyrus 5345 was excavated by Grenfell and Hunt and has never been for sale. No other unpublished fragments of New Testament texts in the EES collection have been identified as earlier than the third century AD. "...excavated by Grenfell and Hunt and has never been for sale." There are still contradictions about what happened. Given that Scott Carroll said (quoted above) that he wanted to exhibit it (in a Green-sponsored Vatican Library event) was there talk about a money fee to borrow it for exhibition? It was offered for sale. When asked about provenance he never offered any. He has had 7 years to clear up this confusion. OK, we clearly see a massive problem on Obbink's side. But what do you have to say, Dr Carroll, concerning Dan's comments that you had known Obbink had changed his mind about the dating of the papyrus at the time when you authorised him to make the public announcement? That doesn't strike me as a particularly clean way of doing things either. Is there any way to prove, via sales records, archived emails, etc. whether P.Oxy. 5345 was actually offered for sale at some point? Something besides a statement that could tie the fragment that Carroll, et al., say was offered for sale explicitly to the fragment published that EES says was never offered for sale. I only learned on 23 May 2018 that D. Obbink still had the papyrus, that it was published and that he changed his view on the date. In 2013, he showed it to me again as still being available for sale with the same story. I truly thought until yesterday (5-23-18), that the Green's had acquired it. I haven't read what D. Wallace has said, but if he implies that I knew that D. Obbink had changed his view of the dating that is untrue--how would he know this? He has never talked to me. Did D. Obbink plant this story as well? BTW I hardly had the authority to 'authorize' anyone to say anything nor was this debate, which I only learned about when I met briefly with D. Wallace that day, a platform for me to make an announcement about something that hadn't been acquired. The EES confirms that the Mark fragment comes from Grenfell and Hunt’s excavation at Oxford, probably in 1903 (on the basis of the inventory number), and that it has never been for sale, whatever claims may have been made arising from individual conversations in the past. Scott (if I may), if what you're saying is correct, then I must have misidentified you on the basis of my reading Dan's remarks ('A representative for who I understood was the owner of FCM urged me to make the announcement at the debate, which they realized would make this go viral ... I learned that the rep knew, two weeks prior to the debate, that the papyrologist had changed his views.') If I was mistaken in identifying you as the 'rep', I sincerely apologise. TEES - could you tell us who owns the fragment pls? Also, if this was excavated from Oxyrhynchus, does that mean this fragment was not part of any mummy mask as was previously claimed? Dear EES, thanks for the statement. Could you please clarify this part "on the basis of a provisional dating when the text was catalogued many years ago" for me? (1) Does this mean that the provisional dating was not done by Obbink himself? (2) When exactly was the text catalogued? (3) Does this imply that there is an old list of provisional dates of (some of) the unpublished Oxyrhynchus papyri? No apology necessary. His statement is confusing. I represented the Green's collection. I met with D. Wallace to place a Green papyrus with him to study with his students. In our short visit, I had mentioned D. Obbink's dating of the Mark 1 papyrus and his offer to the Greens. I was completely unaware of the change of dating until yesterday 5-23-18. Seeing my name is not mentioned by D. Wallace, I won't expect his apology. But if he meant me as the 'representative' the notion that I knew that D. Obbink had changed the date (and in addition was both intentionally deceptive and manipulative) this is totally untrue. And I would ask where he got such specific information never having talked with me unless it came from D. Obbink--covering his own tracks. It's possible he meant someone else. That's for him to clarify. Who could have (supposedly) conveyed to me that the date had been changed, unless it was D. Obbink? Who conveyed to D. Wallace that I (supposedly) knew of this change and (supposedly) intentionally used D. Wallace and exploited the situation? If it is not true, why would someone do that? And for the record, both times I saw the Mark 1 papyrus were in D. Obbink's office at Christ Church. It was in a fold of paper in a pile of other things he was trying to sell, sitting on the pool table in his office. An odd place for a papyrus in the Oxy collection. Hi Scott, on what grounds should we believe your version of events? You haven’t been employed by the Greens for years now. And it is your word against that of an Oxford professor. Anyone else who sat in on your conversations? Who do you work for now? With respect, other Anonymous, it's not Scott's word against that of an Oxford professor. No Oxford professor has commented on the record on what Scott is saying. Ok, fair enough. But for whom is Scott Carroll working now as he has left the Greens years ago? Peter Malik, regarding the change in date by Obbink, it's possible that you misunderstand what Wallace said. The revision in date that Wallace refers to Obbink having made prior to his debate is merely a change from strictly 1st century to the broader 1st/2nd century. Scott's initial statement in these comments is consistent with that, saying that as late as 2013, Obbink was still saying 1st/2nd century. In Scott's reply to you here in this thread, it looks like he is taking you to mean that Obbink had already by that time revised his date to 2nd/3rd. But that is not what Wallace claims. 1. Wallace was encouraged to make a leak by the 'rep' who told him about the first-century dating by Obbink. 2. The debate took place early in 2012. 3. Wallace learned that the 'rep' already knew at the time of the announcement that Obbink had changed his views concerning the dating. My point isn't about the specificity of the dating. It is on the rep's authorisation to make an unfounded announcement when he/she had already known that the information being communicated is incorrect. Now it appears that Scott Carroll wasn't the person--based on his remarks here. OK. I see that. I think that Scott in answering you above thought that it was being said that he knew about Obbink's revision to a 2nd/3rd century date, when that wasn't what was being said. Whoever this rep was knew that Obbink was at that time touting a 1st/2nd century date. And Scott also, whether he is the same rep or not, did (it seems) know about the 1st/2nd century dating at that time. Wallace may be talking about someone else. But if so, it's not for the reason (the change in date) that Scott was apparently thinking in his answers above. At any rate, I'm not making any inferences about who Wallace is talking about. I have no idea. Like I said, given what Scott has written above I'll give him the benefit of the doubt, and have apologised accordingly for undue criticism. Scott, if you don't mind, can you confirm that this was the only offer made by Obbink whilst you worked for the Collection? If not, were the other ones accepted? Scott, when you told Wallace about the manuscript, did you only tell him that Obbink dated it to the first century? Or did you tell him that he dated it to a range of the late first or early second century? Above you say, "I would ask where he got such specific information [about the date range being enlarged to include the early second century] never having talked with me." One possible place he got it is not by talking to you, but by hearing you make public statements which are still available in videos online, where you yourself give a range that extends into the early second century. This is exactly the date range you say that Obbink gave you in both 2012 and 2013. But when the person Wallace calls the rep told him about the manuscript (and you say you told him about it), Wallace insists that rep did not say "late first or early second century," but strictly "first century." there is a fragment of Mark, and it’s a very small fragment, not too many verses, but it’s definitely from Mark. And the most amazing thing about this is that it’s from the 1st Century. We don’t have any other New Testament manuscripts that are written within the same century that the Gospels and the rest of the New Testament were written in. This is the first. And it’s dated by one of the world’s leading paleographers, whose name I’m not allowed to reveal yet. It will be published in a book with six other manuscripts that are either probably or definitely from the 2nd Century in about a year from now. And this is very, very exciting news, frankly. To have a fragment from one of the Gospels that’s written during the lifetime of some of the eyewitnesses to the resurrection is just astounding. Understandably, there is a collective let-down that 'FCM' turns out to be dated later. But lets not lose sight of the fact that these are still early and interesting fragments. I'm sure Oxford will cope. Being 900 years old helps keep things in perspective. And when Oxons can't cope, they move to Cambridge and begin to experience sudden flashes of happiness which quickly turn into showers of glory. But I digress. Talking to yourself again Anonymous? Thanks for checking in, Ferdie. The person that's discovered your blueprint wasn't Peter Head. Hopefully the dust will settle soon and everybody can appreciate the fact that there is now one more, vetted and published, pre-Constantinian fragment of Mark - very likely earlier than the other one. For what it's worth, the statement that (before the publication of the last vol. of Oxy. Pap.) there was a fragment of Mark that had been dated by a competent papyrologist to the first century was apparently never false. It just wasn't the papyrologyist everybody was thinking of (don't know exactly who, yet - EES, help??). It was a provisional and 'unpublished' date, but then, everybody knew that anyway (or should have). So IF Obbink told Carroll it was first-century, he was giving the only date that had been assigned up to that point. Elijah, thanks so much for your work on this. You obviously opened a huge can of worms. Who said TC wasn't interesting? You know what they say about being on TV, it makes fragments look 20-50 heavier which is a negative if you are trying to date. Why has the papyrus been taken down and by who? See Updates 3 and 4 in the original post. After this whole saga, is Dirk Obbink still co-editor of P.Oxy for future publications? I reckon we should be able to get to a hundred comments on this post. What does everyone else think? What a stupid thing to aim for! If it is going to happen, just let it happen organically, no need to coerce the crowd. Apologies, I don't know what came over me. Could someone please be so kind as to inform Dr Peter Obbink that he’s responsible for this significant milestone? I’m sure he’ll be delighted. When Roberta Mazza says, "This papyrus IS and always has been part of the EES collection stored in Oxford. And yes, I know this as a fact," what does that mean with respect to Scott Carroll's claims? Is she saying that Obbink would not be able to remove the manuscript from where it's stored and take it to his office? Because as far as I can tell, that's all that would have been necessary. If Wallace still believed the Greens/MOTB owned this manuscript when he saw it (presumably while it was in Obbink's possession), and it was with them that Wallace signed his NDA, then Obbink was in on convincing Wallace that the Greens/MOTB owned the manuscript. More than that, it may even be that Obbink convinced the Greens/MOTB that they truly were the owners, while the physical manuscript remained in his possession. At any rate, the need for Obbink to be involved in Wallace's agreement to sign that NDA in exchange for being able to see the manuscript supports Scott Carroll's account that Obbink had fraudulently pretended to have the authority to sell the manuscript to the Greens. According to the EES: "No other unpublished fragments of New Testament texts in the EES collection have been identified as earlier than the third century AD." 1. How long ago was the Mark fragment identified and why did it take until 2018 for it to be published? 2. How many other NT papyri are known of by the EES in the collection, how long ago were they identified, and how long do we have to wait until they are published? The EES will, in due course, prepare a consolidated response to the various points raised in recent contributions here and elsewhere. Thank you so much for graciously providing a copy of the edition of P.Oxy. 83.5345. We are all indebted to your generosity. I look forward to your forthcoming response as well. Plainly, contradictory claims have been made. And puzzling unknowns remain. Your response will be most welcome. Thank you, EES. I do hope the forthcoming response includes some tangible evidence. 1. Do you have enough “trained eyes” working hard to get all the New Testament papyri in your collection published? How far are you with them? 2. Do you have a thorough and initial “vetting process” whereby papyri with possibly early dates are placed in a streamlined sequence for publication? 3. Can’t you network with a couple established papyrologists and textual critics to work out a strategic plan to attract more PhD candidates to work on unpublished Oxyrhynchus papyri? "Later in 2012 I did get the opportunity to see the manuscript.--but had relied in Feb. on what he was told (by whomever). I think we may be able to get to 200 comments to this post, as the world awakens to the depth of this scandal. So here's my chance to throw in my farthing's worth: In my day job I enter orders on a computer, and among the inventory codes I type in are those for two different sizes of pure oxygen tanks: P OXY SMALL and P OXY LARGE. I would describe this as a P OXY LARGE event. Another inaccuracy, or perhaps just an editorial opportunity taken to increase the level of scandal, in the Moss/Bader article: They state it to be "...more probable, that “first-century Mark” was something of a red herring all along: that it was in fact always dated later..." whereas the EES has said that the earlier reports of a possible dating "to the late first century AD" were made "on the basis of a provisional dating when the text was catalogued many years ago." That is a good observation, Dr. Hill. I thought it was striking that EES acknowledged the original first-century dating. I would like to know more about the italicized portion of this sentence: “This is the same text that Professor Obbink showed to some visitors to Oxford in 2011/12, which some of them reported in talks and on social media as possibly dating to the late first century AD on the basis of a provisional dating when the text was catalogued many years ago.” How many years ago was this? Was it before 2011? Surely if this had been cataloged as a first century Mark fragment much before 2011, it would have been published before now. It could have been initially cataloged as first-century without being identified as Mark. But it seems that Obbink, when he knew it was Mark, continued to tout a first-century date to multiple people connected to the Greens, whom he knew were interested in buying it, and to whom according to at least one eye-witness he tried to sell it, while also neglecting to mention to any of them that it was from Oxyrhynchus and owned by EES. Is it not possible that a provisional date was assigned to the fragment before its contents were identified? This apparently happened in the case of P.Oxy. 3.405 , the Irenaeus fragment. Maybe that is why it didn’t draw enough attention to get published earlier. Was it originally catalogued as Mark? Even if the original autographs of the Gospels were discovered, what would it prove? The overwhelming majority of NT scholars do NOT believe that eyewitnesses nor the associates of eyewitnesses wrote the Gospels. Even scholar NT Wright has said, "I don't know who the authors of the Gospels were and neither does anyone else". Therefore, we do not know if the stories told in the Gospels are historical facts or literary embellishments, embellishments perfectly acceptable in the genre in which they were written---Greco-Roman biographies. The days of Christians using the Gospels as primary source documents to support Christianity's supernatural claims are over. The discovery of first century fragments of copies of the Gospels will not change that. Can I suggest to everyone that you refer to the Mark fragment as "P137"? This is much simpler than P.Oxy. LXXXIII 5345, and when it inevitably gets its own Wikipedia article that's what it will be under. Other than that keep up the good work on this post, I've had to update my own blog post as well numerous times due to the information changing! I will only add what I said on my blog - I now have almost no respect at all for the academic integrity of Evangelical scholars - Dr. Wallace included. Like many others I am EXTREMELY DISAPPOINTED in the conduct I have seen of academics that HOLD TEACHING POSITIONS! What does this say about the institutions that employ them? It tells me the culture is toxic. A culture where spreading lies and misinformation to the public, and their peers, is acceptable. These people have lied, repeatedly, and NO ONE corrected the record until publication. Dr. Gary Habermas was still lying about this in February 2018 to an audience IN A UNIVERSITY! Is Liberty University going to fire him over this? Probably not, like I said what an absolutely toxic culture that must exist amongst American evangelical scholars. Now I'm no fan of Richard Carrier, but after all this it seems that simply dismissing his credentials because he "doesn't hold a teaching position" is completely disingenuous. Rather, almost no respect for an Oxford papyrologist hiding ancient papyri in a folder on his pool table, selling them to the highest bidder. Oxford always gets away with these kinds of unethical behaviour. Maybe it’s time for that to stop! upvoted Aractus for hitting the nail on the head regarding the integrity of much of the academia. Absolutely. The institutions that employ these people need to be held to account. They have lied, consistently, for six years. All of the scholars involved, that have made a statement on the matter, are blaming other people. Passing the buck. Dr. Gary Habermas was still lying about it in a University where he is employed just 3 months ago!! This is an extremely serious breach of academic integrity. If the institutions do nothing, if they fire no one, then we know what their academic standards are. And that is that they have none, that there's another agenda that is a higher priority to them than academic integrity!! This whole controversy was created on an Oxford pool table, in an Oxford university professor’s office. Lying is quite the wrong word if you've been following what's happening. Were deceived may be better. Used very poor discretion and were duped may be appropriate too. The Aracus’ on this blog have their knifes out for a couple evangelicals who made inaccurate public statements about what we now know is P.Oxy. LXXXIII 5345. No doubt, they should’ve waited for peer reviewed scrutiny before making bold claims in apologetic setttings. However, the origin of the controversy, it seems, must be placed squarely at the feet of specifically professor P. Obbink and dr Scott Carroll (the latter who, at the time worked for the Greens!). I have read through all the comments thus far, and is convinced that there are facts known to textual critics who have left comments but who are not forthcoming in sharing it with us. It’s no secret that a number of textual critics connected to this blog have special contracts with the Greens (for whom Carroll worked when he met Obbink). What are these scholars hiding? Keeping silent because they are receiving money from the Greens? I really appreciate it that EEC has made the 5345 publication available on-line. It must have been quite the challenge dating the hand, given the small size and poor quality of the fragment. I did want to flag that there are similar characteristics between 5345 and P.Oxy.XI.II 3022, Letter of Trajan to Alexandria, as available on the Oxyrhynchus Online site. Trajan favors rounded C and Ε, but also has examples of more vertical (and angular) C and E. The M has a similar lower half-serif, saddle, and join. Trajan (3022) strongly favors looped A, but it appears that there is an angular A in an early KAI, while 5345 seems more evenly split in looped and angular A. The TOIC in 5345 and the TAIC in 3022 look remarkably similar, as do the CEI in 5345 compared to the ECI in 3022. 3022 is dated 10 Oct – 9 Dec 98, so I will keep an open mind on the date until more of the manuscripts referenced in the EEC publication become available to the public. Hi Dan, thanks for bringing this parallel up, but the similarities are occasional at best (and illusory at worst) and do not betray similarities in the overall graphic background/stream/style of each hand. The contrast b/w broad and compressed letters, which is one of the hallmarks of the style attested in 5345 is much less pronounced in 3022 (see esp. the broad epsilon and sigma). In 3022, the strokes tend towards curvature. Etc. Thanks Peter, for investing the time assessing my proposition. Is there a website where the publications referenced in the 5345 publication are available (e.g., the earlier Oxy publication of III 454, XIII 1622)? "I have been told by Daniela Colomo that Revel Coles provisionally dated the fragment, which had not yet been identified as Mark, to the second, not the first century CE. If she correct, the EES statement is inaccurate." All these conflicting information unfortunately makes it almost impossible to trust anyone, including the EES! Until the EES is 100% forthright and forthcoming in explaining precisely how their contracted papyrologist from Oxford behaved, their credibility and legitimacy will suffer. There are too many loose ends to this controversy, and unfortunately, most of the unanswered questions go back to the EES and an Oxford papyrologist. On the question of whether a date could have been assigned to the script long before the text on the papyrus was identified as part of Mark 1 (Eric Rowe, Chill, and Stephen Goranson): I consider it very likely that Grenfell and Hunt could have identified this as Mark on the basis of ]webaptisaumasud[ (line 3 'recto'), if not pniag[ (line 4 'recto'). Grenfell and Hunt successfully identified texts when they had even less than this to go on and less legible text (granted: this side is 'badly abraded'). This situation is different from the Irenaeus fragment that was mentioned. That was ingeniously identified as part of a lost Greek text on the basis of its extant Latin translation. Mark was far more familiar to Grenfell and Hunt and was well served with printed concordances, etc. Reference to baptism should have been enough of a clue and the NT would have been a good place to start looking for possible matches. 'Unidentified Theological Text' might have been a possibility, but face would be lost once Mark was easily identified. However, if the fragment's texts could have been identified so easily, it is curious that it was not published earlier (closer to 1903). Grenfell and Hunt were particularly interested in publishing Biblical and 'Christian' texts, hence the volumes still start with 'Theological Texts' and P.Oxy. I 1, 2, and 3 were the logia Iesou (later, Greek Thomas), Matthew, and Mark, all ahead of new Classical texts, notably P.Oxy. I 7, lines of the poetess Sappho (the Greek author(ess) most likely to be a household name...). Thanks, Patrick. Yes, unlikely that it was not identified early, and if it was, unlikely it was not published. Also, as Brent Nongbri has pointed out on his blog, because it is a codex, it is unlikely that a 'first-century' codex would not have been published, as exceedingly rare, no matter the contents. And yet we have a) the EES statement that a provisional dating to the first century AD was made 'when the text was catalogued many years ago,' and that this was the basis for the claims made on social media after the Obbink showings in Oxford in 2011/12. And b), strange as it may seem, the Geoff Smith report (mentioned above by Stephen Goranson) that, according to Daniela Coloma, Revel Coles provisionally dated the fragment to the second century before it had been identified as Mark. Apparently the contents were unidentified for a long time. The forthcoming report by the EES should be interesting. But I might just wait for the movie. Considering the sheer volume of texts, can we even be sure if this fragment would have even been read for decades? It was only cataloged in the early 60s. One factor may be when it was cleaned. If available, has anyone asked Revel A. Coles? Whether remembering an early codex, etc. You indicate in your statement that "The identification of the fragment as Mark was made in 2011 by a researcher working for Professor Obbink, then one of the General Editors of the Oxyrhynchus Papyri series." Is it possible that this "researcher" is the counterparty to Wallace's NDA? Wallace claims to have signed an NDA in order to see the fragment, but your statement indicates Obbink only showed it to Carroll and some Oxford students. So if Obbink didn't show Wallace the fragment, someone else must have (the mystery "researcher"?). Otherwise, it seems as though Wallace is lying about the NDA (which also suggests that he never actually saw the fragment). To your knowledge, did Wallace ever actually see the fragment prior to its publishing. If so, when? Now will Steve Green, among others, comment for the record? John Dickson seems to have had his hands on it quite recently. I’m starting to think there never was any NDA at all and that Wallace never actually saw the manuscript prior to its publication. There are so many things in Wallace’s story that do not square with the most recent response from EES. What is striking about Wallace’s own statement on his blog is his claim that he was initially authorized and even encouraged to disclose the existence of FCM in his debate with Ehrman in order to make it “go viral”, but that he later signed an NDA (in order to see the fragment) that precluded him from saying anything “about when it would be published or whether it even exists.” So he was initially authorized and encouraged to disclose the fragment’s existence in hopes of creating widespread publicity, but later not allowed to speak about the fragment’s existence per the NDA? This makes little sense, unless Wallace means to suggest that the counterparty to his NDA was not the same person/group who initially told him about the fragment and encouraged its disclosure. Whatever the case, the version of the story offered by Wallace does not at all square with the responses from EES. Someone is lying. I find Dan Wallace's claims that he was encouraged to announce the (hearsay/good authority) ms at the debate, that he later signed a NDA, and that he still later (but pre-publication)saw the ms (whether the ms itself or a photograph?) as entirely possible. The less understandable parts, so far, include why some non-EES-authorized entity *may* have presumed proprietary rights that did not property obtain. You write: "I find Dan Wallace's claims that he was encouraged to announce the (hearsay/good authority) ms at the debate, that he later signed a NDA, and that he still later (but pre-publication)saw the ms (whether the ms itself or a photograph?) as entirely possible." Well of course it's possible. I never said it wasn't. What I am pointing out specifically is the bizarre clause in the alleged NDA that precluded Wallace from acknowledging the existence of something that he had already proclaimed to the world existed! In other words, the cat was already out of the bag! So that particular feature of the alleged NDA makes no sense! Wallace writes in his blog: "I was told in the non-disclosure agreement not to speak about when it would be published or whether it even exists." Do you not find that strange, especially in light of Wallace's claim that he was initially encouraged to publicize the manuscript? As to whether or not Wallace claims to have seen the actual manuscript itself or a photograph (which you seem to question in your comment above), read what Wallace writes in his blog: "Later in 2012 I did get the opportunity to see the manuscript. I was allowed to see it only after I signed a non-disclosure agreement... With only a few minutes looking at the papyrus, and no permission to take pictures, I too had to wait, like everyone else, to see the publication." Clearly, Wallace is claiming to have seen the actual manuscript itself, not a mere photograph. Again, this does not square with the EES statements. Frankly, there is no reason to think there is any congruence between Wallace's story and the statements made by EES. "This is the same text that Professor Obbink showed to some visitors to Oxford in 2011/12, which some of them reported in talks and on social media as possibly dating to the late first century AD on the basis of a provisional dating when the text was catalogued many years ago." "Professor Obbink says that he did show the papyrus in his rooms (where it was temporarily for teaching purposes) to Scott Carroll, but to no-one else except some Oxford students. Other than Oxford students, was Scott Carroll the only visitor who was shown the papyrus or were there multiple non-Oxford student visitors who were shown the papyrus by Dirk Obbink? Great question! I assume they're referring to Carroll in their earlier statement, but it would be interesting to know who else might be included in that group of "visitors" other than Carroll. The reason I would not think Wallace was included in that group of "visitors" is the following portion of the earlier EES statement: "...which some of them reported in talks and on social media as possibly dating to the late first century AD on the basis of a provisional dating when the text was catalogued many years ago." Recall Wallace initially based his claims in the Ehrman debate, and later on his blog, on the alleged recent findings of a "world-class paleographer" who had become "certain" about the first century dating. Wallace's claims were never made on the basis of "a provisional dating when the text was catalogued many years ago." But yes, I would absolutely love to know all the individuals who were shown the manuscript by Obbink. That would be an important piece to the puzzle. Another reason for thinking Wallace was not counted among those visitors to Oxford to be shown the manuscript by Obbink is the fact that none of the other visitors who were shown the fragment were required to sign an NDA, apparently. And yet, Wallace claims he was shown the fragment only under the condition that he would agree to an NDA, which apparently included a clause that Wallace could not even acknowledge the existence of the manuscript. You are assuming that Dr. Obbink played no active role in all of this. We should critically evaluate the the claims of EES / Obbink also not just the claims of Wallce / Carroll / Evans Habermas. May be Obbink opined that he agrees with the provisional dating pending further studies. From the original EES statement we can conclude that others who publicly talked about this fragment were also part of the team which visited Oxford. We do not know if they were required to sign an NDA, but Evans once claimed that there were around two dozen consultants involved in the study of this fragment apart from the main experts. They were most probably connected with MOTB. So most likely they all signed NDA. Okay, let's think about this. Scott Carroll, who was shown the manuscript by Obbink at Oxford (this is confirmed by both parties), has never claimed to have been under an NDA with EES or Obbink. In fact, at the National Apologetics Conference in 2015, Carroll not only discussed the "FCM" manuscript, he also specifically named Dirk Obbink as the "most important person" involved in the study of the fragment! This type of behavior and level of disclosure is entirely consistent with EES' claim that they were not aware of any nondisclosure agreements. Contrast this with the claims of Daniel Wallace, who now says he was under an NDA so restrictive that he was not even permitted to acknowledge the existence of the manuscript! In other words, it would make no sense for EES to allow Scott Carroll, after being shown the manuscript, to publicly discuss the particulars of the MS and the ongoing study of the fragment, but not allow Wallace to even acknowledge its existence. If Wallace was in fact under an NDA, it almost certainly was not with EES or Obbink. That much seems obvious. First of all, Obbink would never have done that. Secondly, that’s not what Wallace actually claimed in the Ehrman debate in 2012. What Wallace actually claimed was that the greatest paleographer on Earth was certain about the first century dating, not that he was merely okay with a provisional first century dating “pending further studies.” Wallace’s initial claim in the 2012 debate implied that the necessary studies had already been concluded and that the manuscript was to be published the following year (which would have been 2013) by Brill Publishing, which was not even the right publisher, as it turns out. Also, you write: "From the original EES statement we can conclude that others who publicly talked about this fragment were also part of the team which visited Oxford. We do not know if they were required to sign an NDA, but Evans once claimed that there were around two dozen consultants involved in the study of this fragment apart from the main experts. They were most probably connected with MOTB. So most likely they all signed NDA." Hopefully you realize that Evans didn't actually know what he was talking about. You do realize that, right? Evans was convinced the entire time that "FCM" was extracted from a mummy mask--the infamous "mummy Gospel" as it were! Yet, in 2015 Evans admitted he had never actually seen the alleged FCM fragment. Evans had no idea what he was talking about, was never involved with the "real" FCM (now known as P137 dated to the 2nd-3rd century). As it turns out, Evans never knew anything, and frankly we should probably dismiss everything he has ever said about the matter. Clearly, the “three-dozen scientists and scholars” cited by Evans (and also by you) were not even working on the right project! The real FCM project, the publishing of P137 from the Oxyrhynchus stash, never had anything at all to do with “ungluing mummy masks” and extracting a first century fragment of Mark! As it turns out, there never was any first century “mummy Gospel” at all! The whole thing was a sham! In other words, we can safely conclude that neither Craig Evans, nor this group of three-dozen scientists who were dismantling mummy cartonnage, were ever shown the real manuscript by Obbink at Oxford. Therefore, there is no reason whatever to believe any of these people were parties to nondisclosure agreements with EES or Obbink. Dan Wallace has now confirmed that his NDA was signed with the Hobby Lobby Clan, ie, more specifically, with Jerry Pattengale, who was at that time the Executive Director of the Green Scholar Initiative. This supports the earlier suspicion, based also on a Wallace radio interview, that the NDA likely also included publishing access to other papyri that remained subject to the NDA. I imagine Dan sought permission to reveal the other party of the NDA. Dan focuses attention on the other obvious question raised above. Who gave the Hobby Lobby Clan the idea that they might be able to purchase ��137, even providing them with photographs of the fragment or at least allowing their representative to photograph it? It is now doubtful that this could have happened without the knowledge of Dirk Obbink, who has also worked as a consultant to the Hobby Lobby Clan. "-It is true that I never signed an NDA with the EES. The NDA I signed was with Jerry Pattengale, who represented a major collection that was interested in purchasing the papyrus. -Pattengale was not the representative of this collection whom I had met just prior to my debate with Bart Ehrman. That representative was the one who assured me that the fragment was definitely dated to the first century. Had I known that the first-century date was not certain, I never would have said that it was in the debate." Why doesn't he disclose who this second "representative" was? Was he/she someone claiming to represent Pattengale? Why aren't you publishing my comments? Did I say something offensive? Nope. Just got caught in moderation and I didn’t see it.